Beaumont Holiday Home is a 5 bedroom, 2 bathroom, self catering house that can sleep up to 12 guests in the popular holiday destination of Ramsgate. This house is ideal for larger families, or a group of friends looking for a holiday getaway to the coast. The fully equipped kitchen offers a washing machine, tumble dryer and scullery. 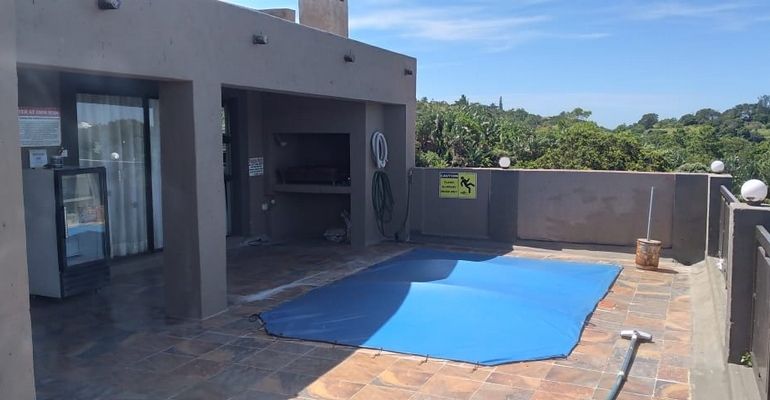 There is a large lounge and entertainment area with ample seating and sliding doors that walk out on the large patio with braai facilities under roof ,a lock up gate at entrance of patio, a splash pool and outdoor furniture. The house features a spacious layout, modern fittings, and breath-taking sea views that will ensure a relaxing and comfortable stay. There are five bedrooms in the house as well as two full bathrooms, one being an en-suite bathroom, and there is also a separate guest toilet. The main, second and fourth bedroom has one Queen-size bed in each, and the third bedroom has one double bed. The fifth bedroom has a double bed and one bunker bed, there is also a double sleeper couch and 1 part only of double sleeper couch in lounge, there is a extra mattresses if required. Full Dstv included in quote. The property also has plenty parking space available within the grounds that is secured with palisade fencing, CCTV cameras, ADT security and Neighbourhood watch. Our rates start from R1800, but please contact us for a detailed quote.